Hilary Mantel has leapt to international recognition in recent years with her award winning historical fiction Wolf Hall (M) and the subsequent Bringing Up the Bodies (M) . Getting to this point has not been easy. In Giving Up the Ghost (M), published in 2003 before her great fiction success, tells the story of her early years growing up in Derbyshire and her struggle with a debilitating chronic illness. Postwar Britain remained economically challenged throughout Mantel's childhood and the story has a feel of an earlier century. I enjoy reading memoirs of childhood and am always amazed at the detail the authors are able to remember. 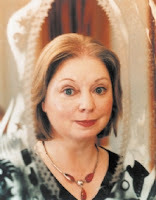 Hilary Mantel's childhood was unusual by any standards and had elements of mystery that would make fascinating fiction. Mantel was born to an Irish Catholic family and had to undergo all the rigours that seem to go along with a Catholic education. All seemed well enough at home until Jack came to stay. Oddly, Jack never left and slowly her father began to live separately from them within the same house, with eventually Hilary, her mother, brothers and Jack moving away. Father Henry was never to be seen again. Mantel was plagued by illness throughout her life - labeled as a child by her doctor as Little Miss Neverwell. As she grew older she experienced tremendous pain and, as her doctors could not understand the cause, they treated her as psychiatric patient, dosing her with powerful medication with devastating consequences. Her misdiagnosis lead to radical surgery which took away her option to have children and left her with a sensation of ghostliness or missing people in her life. This is a fascinating memoir from a person who has great insight into her life. It can be a frustrating and sad read with her many misdiagnoses and the indifference of most the the medical community. However Mantel never gave up and continued to find the courage to pursue a successful literary career (lucky for us) and those suffering for chronic illness can take comfort from her fellow-feeling and her warning to speak up and advocate on their own behalf. While I was reading this book, I was immediately reminded of the New Zealand author Janet Frame (M). Frame had a troubled young adulthood and was admitted repeatedly to a psychiatric facility over a 10 year period. During this time she was also writing and successfully published a book of short stories. While a patient at the facility her book was awarded a prestigious literary prize causing her psychiatrist to rethink his decision and cancel her scheduled lobotomy. Posthumously in 2012 Between My Father and the King presents a collection of short stories by the New Zealand author dealing with themes of memory, family, and loss.